Indian Creek in Kissimmee is a development by Greater Homes located 1 mile south of US192. Indian Creek is in the closer vacation area to Disney World, just 4 miles away! The builders, Greater Homes, have a reputation for high quality homes. Mickey Homes site has over 543 homes, condos and townhomes for sale in Kissimmee FL with Swimming Pool to look at and choose from on the search button above. Jane and Alan LaFrance your Kissimmee Real Estate Agents. Some Popular Street names you may recognize in this community are Oneida Loop, Indian Creek Blvd, Autumn Creek, Summer Creek, Spring Creek and Santee.. Please look below for the current homes for sale and if there are any you would like to see please just give them a shout because their office is close by. Square Footage ranges from 1228 sq. ft. to 2136 sq. ft. There are no HOA Annual Dues in this Community! Indian Creek is not gated but has a lot of community amenities. In the 1st section of Indian Creek you will find a Playground, Putting Green, Tennis Court and Basketball Court. Continue over the bridge to the 2nd section of Indian Creek to find an open Soccer Field and another playground. You will find some homes with lake views. Indian Creek has a total of 460 Homes with 208 Homes in the 1st section and 252 Homes in the 2nd section. Although close to everything the Orlando area has to offer the estate provides a quiet and secluded place to relax and recover from long days at the parks. There is a supermarket, shops and restaurants just minutes away. There are many public golf courses surround Indian Creek for those who want to enjoy a challenging game of golf during their Florida vacation. 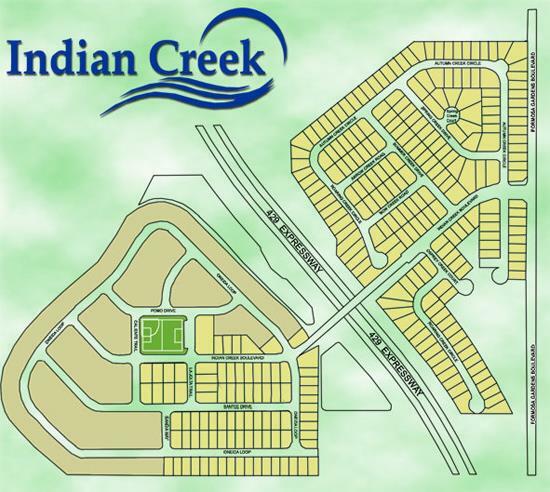 Would you like more information about Indian Creek or to schedule a time to view the subdivision and some properties? We can also set you up on automation so that all new properties and status changes in Indian Creek are sent to your email address. We will be here for you during and after the sale. We are not secret agents.